How to remove the RGB noise from image? I have some RGB images that contain many red, green and blue dots, How can I reomve them without affecting the quality, contrast or the colour of the image? Is there any free code that I can use? Looks like salt and pepper noise. See my attached demos. They do a modified median filter. 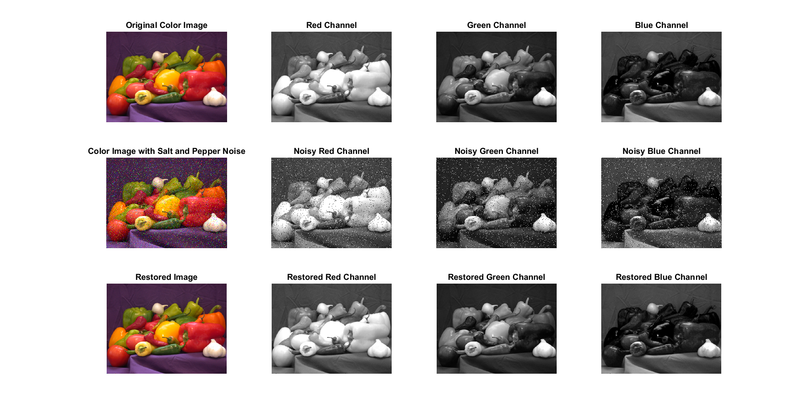 Thank you for your response, However, after applying your code the output and the input are the same, As the image contains RGB salt and pepper noise in the first place, therefore adding new noise then removing it was in vain. I tried to apply the filter directly on the image but there is still too much noise. % Find the noise in the red. What did you use instead of 0 and 255? Attach your code. Maybe you need to look at the pixels and find out what values the noise has. Maybe you should use 10 and 240, or something else. The attached code seems to run pretty well. Here is how i edit it. Please correct me if it is wrong. % and not upon "good" non-noise pixels. % Get the dimensions of the image. numberOfColorBands should be = 3. % Display the original color image. % Extract the individual red, green, and blue color channels. % Display the individual red, green, and blue color channels. % Get rid of the noise in the red by replacing with median. % Find the noise in the green. % Get rid of the noise in the green by replacing with median. % Find the noise in the blue. % Get rid of the noise in the blue by replacing with median. % Display the restored individual color channel images. OK. Now did you try the latest code I attached? It seems to work reasonably well. However in the three lines of the histogram of the free green, red and blue, it shows me error in them. You can comment those out. I just used those to determine the thresholds.Thanks for Accepting the answer. Yes I comment them out. No, thanks to you for your help.